Bollywood actress Karisma Kapoor and businessman Sunjay Kapur officially parted ways after 11 years in 2016. Ever since she had filed for divorce, Karisma has been staying in Mumbai with both her kids Samaira and Kiaan. Kids Samiera and Kiaan are often snapped with their mom but for the first time after the divorce, we see kids bonding with their dad Sunjay Kapur. Post-divorce, Karisma was granted custody of the children while Sunjay has been granted visitation rights to spend time with kids. Samiera and Kiaan recently visited Delhi to meet their father. 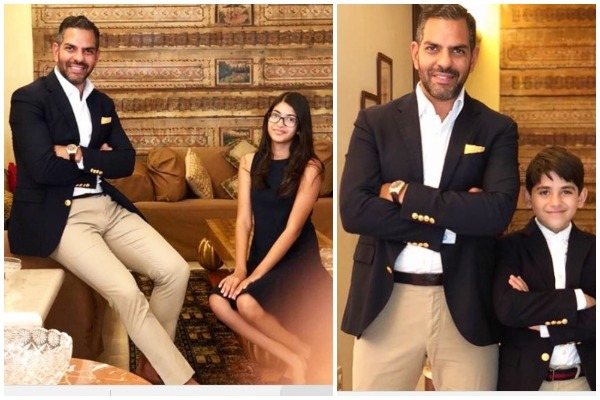 Sunjay’s present wife Priya Sachdev Kapur has shared adorable pictures of kids posing with dad. This is something very amazing yet adorable, isn’t it? Sunjay married Priya last year soon after his divorce with Karisma. On the other hand, Karisma is reportedly dating Sandeep Toshniwal and is speculated that the two will tie the knot this year. Previous : Kangana Hints At Affair With Hrithik Yet Again, Recites a Soulful Poem For The Actor!